This is the first of a special monthly edition of HATiP for nurses and other health care workers involved in task-shifting in sub-Saharan Africa, kindly supported by the Stop TB department of the World Health Organization. This special edition is intended to support the capacity development of nurses and other health care staff as they take on new roles and tasks in the scale-up of HIV testing and counselling, antiretroviral treatment, HIV/TB activities, TB case finding, diagnosis, treatment and cure. We would particularly like to thank Prof. Gavin Churchyard of Aurum Institute for Health Research, Dr Lois Eldred of CREATE and Dr Harry Hausler, Director of the TB/HIV Care Association, Cape Town, for their advice on this edition. Parent-to-child transmission of HIV has been reduced to 3.5% in HIV-exposed children around 6 weeks of age — and the country has also greatly improved the survival of children who do become HIV-positive. The current government and the Minister of Health have of course made some big changes —and one of these changes is for the health system to make much better use of one of its most precious resources: its nurses. Nurses helped make many of these achievements possible, and if the health department is going to reach the targets of providing ART to all eligible South Africans — if South Africa is ever going to achieve the goal of an AIDS-free generation — nurses will have to make it happen. "If South Africa is ever going to achieve the goal of an AIDS-free generation, nurses will have to make it happen"
And they can do it. When given adequate training and support, studies show nurses can initiate antiretroviral therapy and manage most people living with HIV on treatment as well as doctors, referring the complicated cases when they arise to a doctor/mentor. Nevertheless, nurses can initially be reluctant to begin prescribing ART — it can take a while to gain confidence — but as nurses become more comfortable using ART in people living with HIV, access to treatment will increase and HIV care will become more convenient for the patient. Other reports at the conference described how nurses worked together participating in quality improvement exercises to improve their clinic performance or to start providing new service, like providing isoniazid preventive therapy (IPT) to anyone living with HIV who doesn’t have one of the key symptoms of TB (see below). Quality improvement involves using data from one’s own clinics to monitor performance, then nurses and other healthcare workers discuss the clinic’s challenges and suggest potential solutions to improve the performance of certain tasks. The team chooses one of these ideas to try out as an experiment, plan and then launch the experiment, and measure how it affects performance. If the idea improves performance, the change can be implemented in their clinic, and the next round of ideas/experiments can begin. This way, step by step, clinics have been able to greatly improve the quality of care, and effectiveness of activities, such as the programme to prevent parent to child transmission of HIV in South Africa. The nurses themselves suggested and tested many of the solutions to fix that programme saving many infants in the process. Nurses have suggested and tested many of the improvements to the PMTCT programme in South Africa, saving many infants in the process. Recognising that nurses have much more to contribute, doesn’t mean anyone should just dump more work on their shoulders, however. To make the most of their skills to manage and care for patients, the time nurses spend on more clerical tasks must be reduced. One way to do so is by shifting these duties to staff with less medical training. Meanwhile, community health workers and expert patients have shown that they may be better suited to performing other time-consuming tasks that are critical to the success of HIV and TB care, such as adherence support, and tracking down patients who don’t make their scheduled clinic visits. This first issue of the nurse bulletin is an introduction targeted to HATIP's readership who work as nurse trainers and mentors, but over time, our goal will be to highlight examples of task shifting in action that have been shown to improve care delivery, and enable nurses to spend more time with patients. The bulletin will try to provide tools, reminders and aids for nurses and other caregivers that reinforce key messages for nurses related to the topics discussed in that month’s HATiP, the HATiP blog and news from the www.aidsmap.com site — in a way that is relevant and practical for a nurse’s everyday needs. Nurses trained to initiate ART gained the confidence to begin prescribing it to HIV-positive pregnant women with the help of a quality improvement programme in clinics in Ugu District in KwaZulu Natal— reducing the numbers of infants born with HIV, according to one presentation at the 5th South African AIDS Conference. Each clinic used a form called a ‘data dashboard’ (like the dashboard on a car) to record and track data for all the important targets for the programme (like how many pregnant women in the programme got tested for HIV, how many were positive, how many HIV-positive pregnant women were eligible for ART, how many started taking ART before childbirth, etc). As part of the quality improvement process, nurses suggested and tried out little changes to the way things were done in the clinic, and each month, when the clinic’s most recent data would be entered on this data dashboard, they could SEE if their ideas improved how the clinic worked. Community health workers assigned to each HIV-positive pregnant woman made sure each women got their CD4 cell counts tested, received their results, and were not lost to follow-up. The guidelines to help an HIV-positive mother not pass the virus to her infant have changed a few times in the last several years which might be confusing to both patients and care providers. 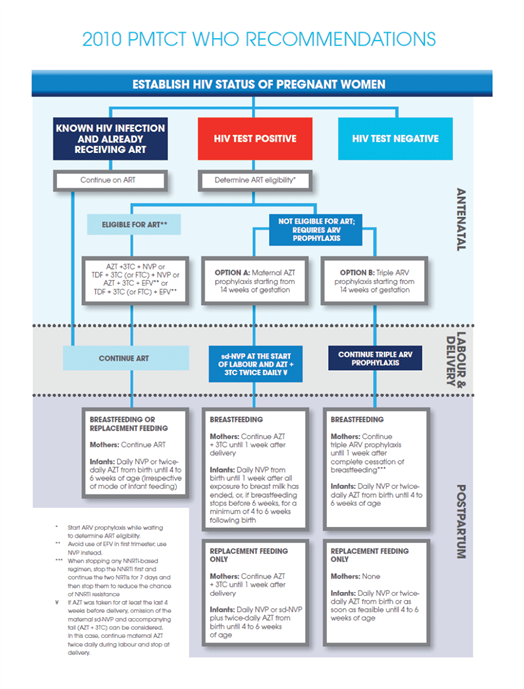 The flowchart on page 4, from 'Paediatric HIV care and treatment – A toolkit for Africa multidisciplinary healthcare teams' describes the 2010 WHO guidelines to prevent HIV-infection of exposed infants, which recommend one of two options based upon a country’s resources. As the Paediatric HIV Care and Treatment Toolkit points out, "it's never too late to start PMTCT interventions; late in the pregnancy for mother or after birth for the baby." "It's never too late to start PMTCT interventions; late in the pregnancy for mother or after birth for the baby." But early diagnosis and treatment, together with discussion about breastfeeding and infant prophylaxis before the baby is born, will greatly improve the chances of delivering a healthy baby free of HIV infection. Trained lay counsellors making door-to-door home visits could provide high quality HIV counselling and testing services according to a study conducted in eight rural communities in Umzimkhulu subdistrict of Sisonke District in KwaZulu Natal. The lay counsellors were all recruited from the communities in which they work. Training to perform the rapid tests consisted of a two-week training course, with six weeks in-service training in clinics before counsellors were sent out to provide home based testing. The lay counsellors receive about the same pay as counsellors in the clinic. A registered nurse supervises the team. In the study rapid HIV tests were provided to anyone in the household who wanted to be tested. Dry blood spots were also collected and sent to a lab to make sure the home-based testing results were correct — and virtually all the time, they were correct. This study demonstrated that trained lay counsellors could safely conduct high quality rapid HIV tests and correctly interpret the results. This supports the recent change in policy of the South African Government allowing lay counsellors to do finger prick sampling for certain blood tests. Rapid HIV testing needs to be backed up by effective linkage to HIV care and treatment programmes. This will enable newly diagnosed people to quickly undergo TB screening and CD4 cell testing, and be linked to treatment services including IPT and ART (if eligible). Lay counsellors were able to conduct high quality rapid HIV tests and correctly interpret the results. This can speed up the patient's access to the right medical care. Task shifting of HIV counselling and testing to community-health workers is necessary because the formal health sector doesn’t always reach people where they need services in the community and at home. Many people in sub-Saharan Africa have been exposed to TB and people living with HIV have a very high risk of developing active TB. Because of this, WHO recommends that people living with HIV should be screened for symptoms of TB every time they visit a health facility or have contact with a healthcare worker, according to 2011 guidelines. Although it is harder to recognise and diagnose in HIV-positive people, WHO research has found that virtually everyone (97.7%) living with HIV who gets TB will have at least one of four common symptoms of TB —and if none of these symptoms are present, a person is highly unlikely to have TB. However, they may still be at great risk of TB, so WHO also recommends that HIV-positive people who do not have any of the symptoms on WHO’s 4 Symptom Screen, should be given a course of isoniazid preventive therapy — even pregnant women and people previously treated for TB. Answering “no” to the following four questions has been shown to be 98% effective in ruling out active TB disease in high prevalence settings. Have you had a cough in the past 24 hours? Do you have drenching night sweats? 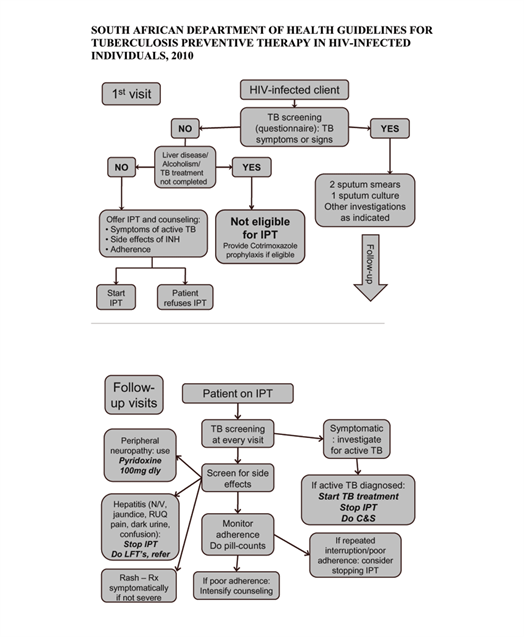 If a patient answers YES to one of these questions, DO NOT START IPT and evaluate further. If TB is not thought to be likely, the patient should be managed appropriately and followed up to ensure that the symptoms resolved. Does the patient drink alcohol excessively? Does the patient have any known liver disease? If the patient does not drink excessively and has no known liver disease, begin Isoniazid preventive therapy (IPT). IPT has been shown to significantly reduce the risk of active TB in HIV-positive people latently infected with TB, and in most cases can be given safely along with antiretroviral therapy. Although a tuberculin skin test (TSTs, which provide evidence of latent TB) could identify those patients most likely to benefit from IPT, it can be difficult for some programmes to perform, so the guidelines no longer requires TSTs in many countries with a high burden of TB. South Africa and a number of other countries have made WHO’s ICF/IPT guidelines national policy. As a result more and more patients are being put on IPT, though one study found that implementation and support for the policy in South Africa varied by district and province. The study also reported counselling for patients put on IPT was generally of poor quality or incomplete. Why it is important to cut down on alcohol intake (ask about intake and discuss ways to cut down if needed). A quality improvement approach was used in Sisonke District, KwaZulu Natal to increase the percentage of HIV-positive people starting IPT, with a dramatic uptake in delivery (up from 19 to 81% of the programmes targets) in less than year. Around 98% of the people put on IPT completed six months of treatment. Programme components included improved training on TB/HIV and IPT, nurse mentors to provide on the job support, and the introduction of an IPT register for all clients started on IPT. Each month entries were made in the register of the client’ weight, treatment adherence, side-effects and whether they had been screened for TB that month. Although IPT was only given for six months, entries were made in the register for each patient out to 24 months, to see how many of the developed TB despite taking IPT. Adherence was monitored using a diary system and clients were recalled if they did not show up to appointments. A system was developed to engage community health workers/caregivers and each client put onto IPT was linked with a community caregiver to support adherence. Nurses can prescribe IPT, but many are reluctant to do so because they have heard there is a risk of resistance developing to isoniazid or they are afraid it may cause side effects. All medications cause side effects, including isoniazid, but most of these can be either managed or avoided. Pyridoxine (vitamin B6) (25mg daily) should be given to all participants who are prescribed IPT to reduce the frequency of side effects like peripheral neuropathy. The following section on side effect management is derived from the Aurum Institute’s Q&A on IPT in South Africa. What are common side effects of IPT? Patients taking IPT commonly report minor side effects, mostly in the first month of treatment. In a survey of SA gold miners during the first month of IPT, > 60% reported feeling increased appetite and energy, > 33% reported increased libido. Specific symptoms were uncommon: >5% reported headache, <5% reported itchy skin, joint pains, diarrhea, nausea, stomach pains, and/or decreased libido or energy. Are there any potentially serious side effects? Though uncommon there are potentially serious side effects including hepatitis, hypersensitivity rash, psychosis and convulsions. Light stools or dark urine? How do you screen for and manage drug-induced hepatitis? Educating patients about signs and symptoms of hepatitis assists in early identification of this adverse event. If clinical hepatitis is suspected, stop INH immediately. It is not necessary to order routine liver function tests before or during IPT. Studies have shown transient increases in liver function tests during IPT that revert to normal once IPT is completed and have no clinical significance. If a patient develops clinical hepatitis, monitor with liver function tests. If a patient is on nevirapine, consider switching to efavirenz. How do you screen for and manage INH-associated peripheral neuropathy? Continue IPT and have the patient return in one month. If on stavudine (d4T) consider switching to zidovudine (ZDV) or tenofovir (TDF). How do you manage INH induced hypersensitivity rash? If the patient develops a mild rash, temporarily stop INH until the rash has resolved. If the patient develops a severe rash, permanently stop INH and refer urgently for further management. What do you do if the other serious side effects of INH, such as fits, psychosis or rash occur? If other serious side effects occur, stop INH and treat the symptoms. 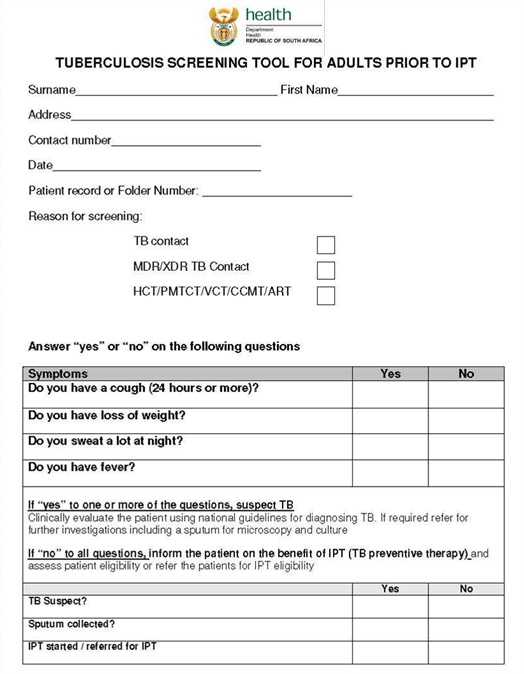 On pages 7 and 8 we have reproduced the South African Department of Health TB screening tool and two flowcharts which show the recommended protocol for managing people with HIV after TB screening, with an emphasis on patients where active TB has been ruled out at first screening visit. HATiP is a regular electronic newsletter about HIV treatment and care in resource-limited settings, aimed at health care professionals. HATiP began publishing in 2003 and is edited by Theo Smart, who is based in Cape Town. HATiP pays special attention to HIV/TB issues. You can see all the previous editions of HATiP here, and search them by topic. The blog covers subjects that don’t always fit into longer HATiP articles, and tries to stimulate discussion and comment about practical issues in HIV treatment and care.